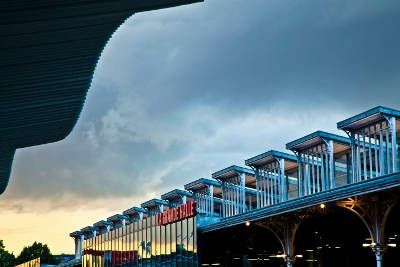 The Grande Halle de La Villette is situated south of the park entrance at la Villette, in front of the square called Fontaine-aux-Lions. Of the 3 halls that existed when used as an abattoir, this is the only one left. The Grande Halle and its modular spaces is used for professional and cultural events, shows, festivals, trade fairs for the general public and professionals. Festivities and events usually take place in all the park. The park and the Grande Halle are as one. The Grande Halle counts for a surface area of 20,000 m² with scenographic installations and can receive up to 15,000 people. It consists of a reception/ticket desk, a café-restaurant, La Petite Halle and a bookshop – "La Librairie du Parc/Actes Sud" (open from Tuesday to Sunday from 11am to 7pm). Villette in circus – "Villette en cirques"
The jazz festival "Jazz à la Villette"
In 1974, the abattoirs at la Villette located in the 19th district Paris closed for good. Bernard Tschumi was hired to redevelop the 55 hectares of this industrial wasteland and so he created park de la Villette, the largest green space in Paris. The Grande halle, an architectural gem, was built in 1867 by Jules de Mérindol. In 1985 The Grande Halle became a multipurpose venue for shows and was renovated by Bernard Reichen et Philippe Robert (2005 to 2007). The Grande Halle is listed as an historical monument. The different pavillions preserved in the park - pavillon de la Bourse, pavillon Janvier, pavillon des Maquettes, pavillon du Charolais, including the fountain, Fontaine-aux-Lions-de-Nubie (which was used as a drinking trough at the time of the abattoirs) – are also registered in the French Supplementary Historic Monument list. This urban park is even more enterprising with its numerous establishments and is considered today as a cultural hotspot for art, science and music. La Géode, shows film screenings in giant format and proposes a movie programme all year long with a new movie every trimester. La Cité des Sciences et de l'Industrie, one of the largest science museums in Europe holds numerous exhibitions, conferences for the general public and professionals. With 250 concerts per year, a media library, a rich and varied learning tool and a museum, la Cité de la Musique is both an international and national reference pole. La Philharmonie de Paris hosts major exhibitions, concerts and corporate events. 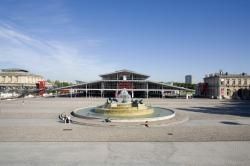 Its roof is accessible at certain times and from where you can have a splendid panoramic view of parc de la Villette. Finally, other event venues and show sites complete this vast programme : Trabendo, Zénith, théâtre Paris-Villette, Cabaret Sauvage... Maison de la Villette, the former roundhouse for the abattoir vets was restored to become, in February 2010, the WIP Villette (a permanent culturel space ). The architect, Bernard Tschumi articulated the development of the park around a triple system of points, lines and surfaces. The points system with the 26 contemporary folies ( quirky constructions that dot the park and royal gardens) set the pace and lighten up the park with their bright red colours. Each one has its own particular form and function. The lines system has 2 axes : north-south and east-west. The surface system has two grasslands : "prairie du Triangle" and "prairie du Cercle". The park de la Villette is open everyday and entrance is free. The Grande Halle is accessible on times of events porposed. The several hotels situated near la Villette are a very pleasant option if you are staying in Paris. Their location close to the park and the canal de l’Ourcq make it easy to stroll or picnic in a green environment in the city. Choice of a hotel here proves practical if you are attending a show at the Grande Halle, or at a concert at the Zenith, or if you are participating in a professional event. Car : there are fee paying carparks around the Parc de la Villette at Porte de Pantin and Porte de La Villette.